MASKerade: CTS8 - Happy Birthday! I have BIG news! I'm now on the CAS(E) this Sketch Design Team! Isn't that just AWESOME? What an honour to be working with these talented and wonderful women. Seriously, go check it out if you haven't before! I'm just so excited! I used a Michael's sentiment (Versafine Onyx and iridescent embossing powder) and Papertrey's Super Stripes to make this very simple card. I hope you'll play along this week! Congratulations... now we will even see more of each other... you are going to get tired of visiting desert diva... LOL! WooHoo! Congrats on your new gig! Congrats on your new DT! Such a great, graphic card. Congrats on your new Design Team appointment! I'm so happy for you! 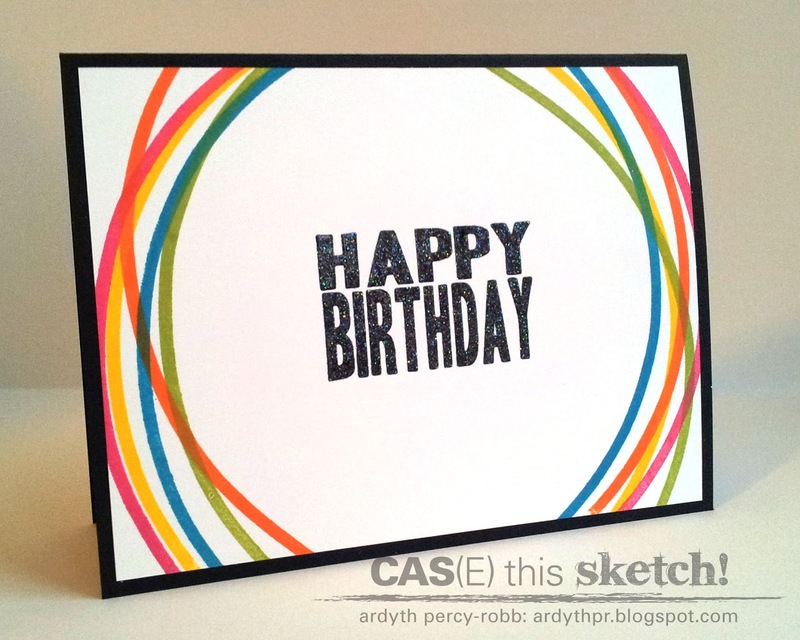 This is a real "Ardyth" card: simple, colourful and fantastic! Hey, congratulations, that IS awesome! Love the curved lines on this card. WOOHOO - congrats! I've loved your style from the moment I saw it, they are very lucky to have you Ardyth! Your card is stunning! A huge congratulations on your new DT appointment AND having your card featured on Papercrafts Connection as one of Cath's favorites! What a great day. You have earned the respect of so many followers with your dedication and amazing talent. Well deserved! What fantastic news! It's so amazing to have you as part of this wonderful team, your cards are always STUNNING! So cool and makes me smile! So glad to have you on the team! Your cards are always show stoppers and this is no exception. LOVE IT! Congrats on being chosen for the CTS design team! Perfect fit, and I love your take on the sketch! This is such a fun card~congratulations! Settling in for my much cherished "Ardyth Time" ... YAY HOORAY!!!! Congrats on your DT! Although I'm not sure what DT wouldn't want you in their ranks. This card proves it. What a clever take on the sketch. Sketches are the hardest challenges for me, by far. I've only done a few. Ardyth, this is beyond amazing! I just want to get inside that clever head of yours to understand where you get these ideas because they are brilliant! So happy that you've joined the team - you're a fabulous addition!